With Christmas nearly upon us and the sun slowly setting on 2017, we’ve taken a quick time out for a moment of reflection on the year that’s been. For us at Quinyx, it has been an incredible year with continued growth across all our markets, exciting developments of the product and the continued expansion of our wonderful team. 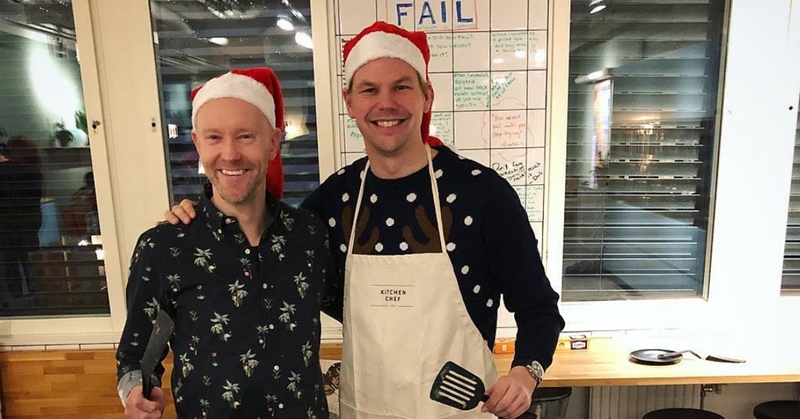 The highlights of the year are too many to list in detail; from breakfast cooked by our CEO and COO and shuffleboard competitions to daily workouts and countless Fikas, we’ve tried to practise what we preach by enjoying work and creating a smiling workforce. The star of the show in January was Aviation Security Officer at London City Airport, Belynda Maquis-Mondesir. She played a leading role in the customer success video we made with the airport and told us her life had changed for the better since they began using Quinyx. You can watch the video and listen to what Belynda has to say here. In February we held our first Power Breakfast in the centre of London. As well as hearing about the future of workforce management, delegates were treated to a great talk by the operations support and training manager at Papa John’s, Matthew Down, where he explained the impact Quinyx is having on their business. Once the number of users of Quinyx hit the 200,000 mark we asked ourselves the question: “Why are people choosing Quinyx?” We spoke to a number of our customers and drew up a list of ten reasons why people choose Quinyx. You can read it here. April saw another first for us as we held the UK’s very first Workforce Management Day. With a keynote speech from former Head of Event Staffing at London Olympic Games 2012, Linda Moir, alongside talks from our partners and customers, the day was a huge success. You can find our top takeaways from it here and a short video capturing the atmosphere of the day here. May brought with it huge news from the UK with the announcement Debenhams, the famous department store in the UK with over 20,000 employees, had chosen Quinyx as their workforce management supplier praising the great product, company focus and culture as the key influencers in their decision. It's been a great year for Quinyx Academy. Not only, did we make our e-learning available to all our users completely free-of-charge, our users completed over 1000 courses, and more than 350 people joined our classroom training. In June, we shared some of the Academy’s success stories which you can read here. July brought with it another success story with Mark Robertson, Head of IT at Benugo holding a joint webinar with us and telling the attendees how Quinyx has led to a 35% reduction on the time spent working on schedules, a 50% fall in the time taken by speaking with staff about their rotas and a 100% improvement in communication. You can see the full webinar here. One of the first questions we’re always asked when we meet new customers for the first time is: “Will we see a return on investment?” In August, we created this infographic to help answer it and gave people the option to calculate how much they could be saving with this calculator. September saw us host the 2017 edition of Stockholm’s Workforce Management Day which was hailed as being the best yet. By bringing together workforce management experts, inspiring speakers and a selection of our amazing customers, the was the perfect opportunity for us to celebrate, learn and be inspired. Here’s what we learnt from it. On October 30th, we were honoured to invite our customers and partners to the Swedish Ambassador’s Residence in London for a dinner discussing how the generation of millennials will reshape the structure of the labour market as we know it, for a truly special evening. If we remember 2017 it will be the year the Workforce Revolution took flight. This revolution is happening because mobile technology, Millennials and big data are combining to change the shape and expectations of the workforce. In November, our Founder and CEO, Erik Fjellborg, hosted a special webinar to explain more about it. Already December has brought with it two reasons to celebrate (and that’s before Christmas!). First up we have this customer success video from Papa John’s, who have seen a 15% reduction in labour costs since using Quinyx. And secondly is the news of investment into Quinyx by Boston-based Battery Ventures. So as we head into 2018, we’d like to wish you all a truly happy holiday season and can’t wait for another year of helping people around the world enjoy work more with Quinyx.